Radical Rock Climb Slide will impress at your next big event or party and keep them climbing for more. Riders must break through the line of inflatable obstacles before tackling the climbing wall. Once they reach the top, then they slide down the 12 foot slide. The rider will exit on the opposite side of the slide allowing other riders free entrance to climb up the wall. The kids will ride the slide over and over and over again. It features bright green, yellow and purple colors, which makes it eye-catching and suitable for boys and girls of all ages. 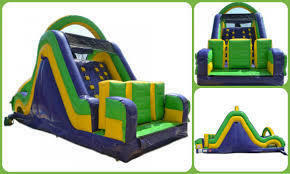 It is ideal for birthday parties, summer or day camps, field days, youth sports team parties or any outdoor event that would enjoy the fun of an inflatable slide combined with the challenge of an obstacle course.